The Vend retail dictionary: 50 terms every modern retailer needs to know. Need to keep up with the trends and technologies making an impact in retail today? We’ve got you covered. This resource keeps you up to date with all the terms, concepts, and trends that are powering modern retail. Also known as “draw tenant”, “anchor tenant”, or “key tenant”, an anchor store is one of the largest—if not the largest—store in a mall or shopping center. It’s usually a well-known department store or retail chain. Anchor stores are great neighbors to have if you’re a small or medium retailer. These stores bring in a ton of foot traffic into your vicinity, which opens up more opportunities for your business to get discovered. This concept is all about supplementing the user’s real, physical world with virtual things, so they appear to coexist in the same environment. AR brings computer-generated objects into the real world — kind of like how in the movie Space Jam, Michael Jordan can be seen playing basketball with Looney Tunes characters. In retail, AR can be implemented in several ways, including shoppable catalogs, apps that let you see in-store deals when you point your phone’s camera towards a specific direction, or even fitting room simulators. 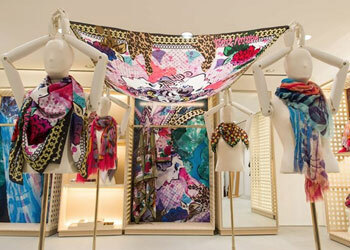 Case in point: Topshop teamed up with AR Door to create a virtual fitting room for its Moscow location. Using augmented reality technology and Microsoft Kinect, they were able to create a fitting room simulator that allowed the customer to see how a dress looks on her without actually trying it on. A built-in camera tracked the shopper’s body and superimposed a 3D model of the garment, so the dress moved and turned with the customer. Its name pretty much says it all. A big box store is a large establishment (often in a square or rectangular-shaped building), that’s usually part of a major retail chain. Examples of such stores include Target, Home Depot, and Best Buy. This refers to sets of data so massive, it would take sophisticated programs and really smart data scientists to make sense of it all. When you’re dealing with Big Data, you’re not just looking at traffic or conversions; you’re analyzing behavior (clicks, open rates, time spent on site), demographic (Census information, income), social information (tweets, shares, etc. ), timing, and so much more. Think of it as analytics on steroids. Crunching the numbers, analyzing, and extracting action steps from all that information takes a ton of work, but it usually pays off for retailers because Big Data gives them tremendous consumer insights. Big Data allows businesses to personalize each customer’s experience and it even lets them predict consumer behavior (i.e. when a customer is in the mood to buy, when they’re about to lapse, etc.). Take Macy’s, for example. With the help of IBM, the US retailer is able to gather torrents of customer information and behavior at a variety of touch points in order to serve up personalized experiences and recommendations. According to IBM’s report, Macy’s combines customer preferences with recent purchase data to deliver “dynamically customized recommendations (such as a complementary clothing accessory or color) or personalized promotions.” Macy’s implements this across multiple channels (i.e. 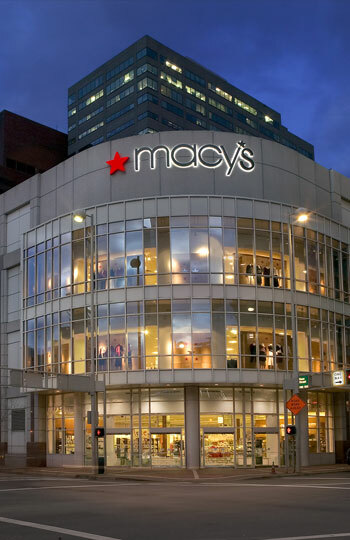 Macy’s physical store or macys.com) to give the customer a seamless experience no matter where they’re shopping. On top of that, the retailer also factors in social engagement such as blogs and gift registries to further connect with its customers. This term refers to retailers that integrate their brick and mortar store with their ecommerce site. These retailers bring the best of both worlds into their business. Most brick and click companies even offer seamless web-to-store services such as in-store pick ups and returns. Powered by BLE (Bluetooth Low Energy) technology, Beacons are devices that can transmit messages to other Bluetooth-enabled gizmos, such as smartphones, tablets, and smartwatches. More important, beacons have the capabilities to “recognize” devices based on their location or previous interactions. This enables retailers to send tailored notifications to shoppers depending on where they are in the store or what type of customer they are. So, if say, a returning customer walks in, the store’s beacon can send her a “welcome back!” message, and when that shopper passes by the footwear section and the merchant happens to have a sale on shoes, the store can give her a heads up via a smartphone alert. Beacons can also be used for in-store analytics purposes. Most solutions come with tools for measuring foot traffic, dwell time, and more, enabling retailers to gather data and further get to know their customers and their store. This is the main checkout area of a retail store. In other words, this is where shoppers head to when they’re ready to pay for their items. It’s where merchants set up their POS system and ring up sales. Most cashwraps even have shelves containing merchandise that shoppers can pick up on their way out. 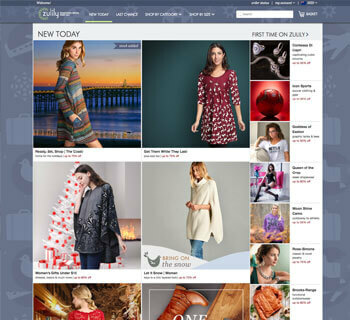 This is a service in which retailers enable shoppers to buy items online and pick them up in their physical stores. Modern consumers love stores that offer click-and-collect because it makes their life a lot easier. They can buy something from the comfort of their home, and just pick up the item whenever it’s convenient for them, instead of paying for shipping or waiting for the mail to arrive. This refers to the practice of displaying or putting together products from different categories to drive add-on sales. Picture this: You’re at the grocery store browsing the liquor section when you see a pack of lemons tacked to the tequila shelf. This is cross merchandising in action. Groceries know that people often take lemons with their tequila shots, so they strategically placed the two items together. This is a technique used by retail associates to deepen their relationship with each customer. Clienteling involves relationship-building activities such as using CRM software to collect and track customer data, providing personalized shopping experiences, and following up with shoppers in a relevant and timely way. This refers to a system of payments powered by near field communication (NFC). They include NFC-enabled credit and debit cards, smart cards, and smartphones that allow customers to complete transactions without physically touching a payment terminal. Instead of having to swipe their card, shoppers can pay for their purchases just by waving their card or phone over a terminal. Sometimes called dead inventory, this is one thing no retailer wants to have, ever. Dead stock pertains to merchandise that has never been sold or has been in stock for a while. Sometimes this is because a particular item is just seasonal, but other times it’s because the product simply isn’t in demand. Retailers can get rid of dead or unmoving inventory through sales or donations, but the best way to deal with dead stock is not to have it in the first place. Analyze the demand in your market to determine the items that you should keep in stock. Also, be sure to manage your inventory well and keep communication lines open between your sales and your purchasing departments. This refers to an arrangement between a retailer and a manufacturer/distributor in which the former transfers customer orders to the latter, who then ships the merchandise directly to the consumer. In other words, the retailer doesn’t keep products in stock. Instead, it sends orders and shipment information to the manufacturer/distributor and they will be the ones who will ship to the consumer. If you have a fragmented customer base (i.e. your customers are scattered across different locations or fall under various socio-economic categories) then you know that growing your business as whole can be quite a challenge. This is where Dynamic Clustering comes in. Dynamic Clustering is all about identifying patterns or opportunities in various and diverse segments to bring about the best strategies for each cluster. Let’s say you’re a national US apparel chain that operates stores in all 50 states. By using Dynamic Clustering, you are able to identify similar patterns and trends in four different states, namely California, New York, Nevada, and Massachusetts. This then enables you to make better and more relevant sales, purchasing, or marketing decisions for that cluster of states. Short for “Electronic Retailing”, this is the practice of selling goods over the Internet. Etailers come in all shapes and sizes, from big name giants such as Amazon and Zappos to neighborhood mom & pop stores selling items on their website. EMV was developed Europay®, Mastercard® and Visa® (hence the name) as a way to combat fraud. It’s a technology that powers chip-and-pin cards, a breed of debit and credit cards that’s far more secure than magnetic stripe (i.e. swipe-and-sign) cards. See, unlike a mag stripe card, which stores static information about the cardholder, an EMV card is embedded with a chip, which creates a unique code that changes for every transaction. This makes it less susceptible to fraud because even if a hacker manages to counterfeit a chip card, the original transaction code is not usable again and the card would get declined. An endless aisle is a feature of brick-and-mortar stores that enables customers to browse and shop the retailer’s entire catalog of products. So rather than stocking up on every item and SKU, you can implement an endless aisle by giving shoppers access to devices like touch screens and iPads. 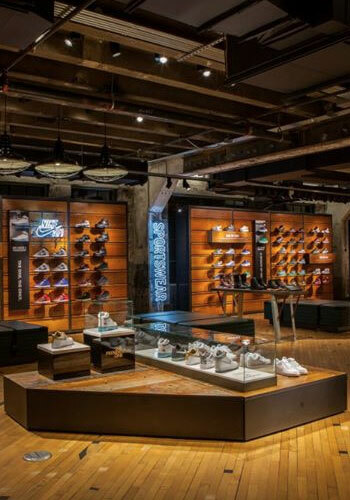 One example of a retailer using endless aisles is Nike. Their store Pasadena CA has large touch screens that enable customers to browse the retailer’s entire inventory. If they see something they like, the customer can purchase it in-store and Nike will ship the item to them. EPOS is an abbreviation for electronic point of sale. Basically, any computerized system used to record sales and control inventory. Learn more about EPOS for retail. Closely related to daily deals, this term refers to sale events that take place for a limited time. Flash sales can last anywhere from several hours to a couple of days and entice consumers with huge bargains (usually 50% and up). The catch is, shoppers have to complete the purchase ASAP. Otherwise, they risk losing the items to other shoppers or they run out of time and miss their chance to grab the deals they want. That’s why customers are encouraged to shop early and shop fast, so they can get their hands on the widest selection. Zulily does announce its flash sales in advance so moms can mark their calendars and prep for the sales they wish to attend. This refers to the environmentally-friendly practices that retailers get into. These can include switching a product’s packaging to a recyclable one or giving customers reusable shopping bags instead of plastic. Other practices, such adding solar panels or replacing store lighting with energy-saving alternatives can also be considered as green retailing. Born out of people’s need for faster services and less wait time, high speed retail is all about making the customer’s shopping experience go by much quicker. Examples of High Speed Retail can include drive-thru grocery stores, pop-up stores, mobile businesses such as food trucks, or any retailer that implements urgent promotions or limited-time sales. The use of mobile POS systems is extremely common in High Speed Retail. This is because aside from being fast, lightweight and easy to set up, mPOS solutions run in the cloud and can update every aspect of the business (inventory, CRM, payments, etc) in real-time, thus helping merchants stay up-to-date at all times. Most mPOS systems also come with convenient capabilities such as emailing receipts and processing mobile payments, making it easy for High Speed Retailers to conduct business much faster. This is a network of businesses and contractors that work and coordinate closely together to manufacture, transport, distribute, and sell retail goods. Unlike a regular supply chain which is more of a linear process that follows a product from one phase to the next, an Integrated Supply Chain is more collaborative and can entail joint product development, shared information, and common systems. IoT is the concept of getting objects such as cars or household appliances to “talk” to each other. More and more things can now connect to the web, and this enables them to communicate with one another. Smartphones can connect to speakers, clocks, lamps, and more. How does this apply to retail? Forward-thinking retailers are now using connected devices to streamline in-store shopping and communicate with shoppers. A few examples of IoT in action include merchants using in-store devices to track real-time shopping behaviors and send tailored offers to customers. This is the practice of selling merchandise at a rate that’s double its wholesale price. Retailers use the keystone pricing formula because it’s simple and it usually covers costs while providing a sound profit margin. This is an agreement between the retailer and the customer in which the retailer puts an item on hold for the shopper until it is paid for in full. The consumer pays for the product in installments (interest-free), and will only receive the item once the payments are complete. The arrangement is a win for both parties. Layaway programs make it easier for the consumer to afford the products that they want, while minimizing risk on the retailer’s side. An LBO is the purchase of a company using borrowed funds. The purchaser will use the company’s assets as collateral so they can get the loan to buy it, and they will use the acquired company’s cash flow (i.e. retail sales) to repay said loan. A known marketing tool in retail, a loss leader is an item that’s sold at a loss in order to attract more customers into a store. Once they’re inside, the retailer counts on the customer to buy other things together with the loss leader, thus generating profits for the business. Unlike limited-time sales or promotional discounts, a markdown is a devaluation of a product due to its inability to be sold at the intended price. The price of the merchandise is permanently reduced to move inventory and make room for new products. Author B. Joseph Pine II said it best: “Today I define Mass Customization as the low-cost, high-volume, efficient production of individually customized offerings.” Mass Customization refers to the practice of offering products that can be tailored to each person’s preferences, but can still be produced with mass-production efficiency. Pine, in his Harvard Business Review piece entitled Beyond Mass Customization, advised businesses to take their offering (i.e. product or service) and break it apart into modular elements, similar to LEGO blocks. According to Pine: What can you build with LEGO bricks? Anything you want, thanks to the large number of modules (with different sizes, different shapes, different colors) and the simple and elegant linkage system for snapping them together. Then you must work with each individual customer, creating a design experience through some sort of design tool that helps customers figure out what they want. If you want to see great Mass Customization in action, take a look at what NIKE is doing. Through its NIKEiD service, the shoe retailer gives customers a truly personalized footwear experience, allowing them to build their own pair from scratch. Customers can simply go online, select the type of shoe they want to design (i.e. running, tennis shoes, etc. ), and customize its look, fit, and performance. Everything about the shoe can be personalized, from the material that it’s made of, to the color of the famous NIKE swoosh on the side. Once they’re satisfied, shoppers can just hit the “add to cart” button and proceed to checkout. This pertains to the services and technology that enable consumers to pay using their mobile phones, instead of traditional forms of payment like cash or credit cards. Mobile payment solutions come in many forms. These days, the most popular ones include NFC-based solutions such as Apple Pay or Google Wallet, and app-based solutions like PayPal. An increasingly common trend thanks to the popularity of smartphones and tablets, mobile shopping is the practice of purchasing goods or services using a mobile device. It’s almost like shopping online using a computer, only with a smaller screen. Mobile shoppers can complete their transactions either on a retailer’s mobile site or with the use of an app. This is an activity practiced by market research companies, watchdog groups, or even retailers themselves to evaluate product or service quality or compliance. The mystery shopper acts like a regular consumer and performs tasks like asking questions, submitting complaints, or simply completing a purchase like they normally would. They would then provide feedback or write reports detailing their experience with the retailer. This term refers to the practice of selling only to a specific market segment. In other words, if you’re a niche retailer, you specialize in a particular type of product (or sometimes a few closely related ones). Niche retailers can be more nimble with their strategies, compared to broader businesses because they cater to specific audiences. This enables them to identify market segments easily and deploy unique and more targeted strategies to address their market’s needs. A good example of a niche retailer is Sunglass Hut, a popular retail chain that specializes in selling sunglasses. Consider this as the next generation of cross-channel and multi-channel retail. Omni-channel means establishing a presence on several channels and platforms (i.e. brick-and-mortar, mobile, online, catalog etc) and enabling customers to transact, interact, and engage across these channels simultaneously or even interchangeably. Giving the customer the convenience and flexibility to purchase an item using your shopping app, and then letting them pick up the merchandise in your store, plus allowing them to process a return via your website, is an example of omni-channel retailing. It’s important to note that omni-channel goes beyond simply being on multiple channels or platforms. Just because you have a website, a mobile app, and a physical store doesn’t necessarily mean that you’re an omni-channel retailer. In order to truly be one, you must fuse all those channels together so they give customers a seamless experience. This is a visual representation that shows how merchandise should be arranged on store shelves in order to drive more sales. It’s a model that indicates the best placement and positioning of your merchandise. Remember that product positioning can influence consumers’ purchases, so planning how they’re displayed and organized can maximize sales. Planograms can also guide and assist in store mapping and they enable retailers use space more effectively. Pop-Up-Stores are short-term shops or sales spaces that come and go within a given period. These stores can be set up in empty retail spaces, mall booths, or even in the middle of a park. Looking to set up one for your business? Here are ten ways to save money on your pop-up store. Usually implemented by high-end retailers and lifestyle brands, prestige pricing is a strategy in which an item is priced at a high level in order to denote exclusivity, high quality, or luxury. When an item is prestigiously priced, it is meant to attract status-conscious individuals or consumers who want to buy premium products. Louis Vuitton is a prime example of a retailer with a prestige pricing strategy. The French fashion house implements premium pricing on all its products; it doesn’t conduct sales, nor does it have any outlet stores. This term is used to describe the series of stages that each commercial product goes through when it hits the market. These stages include introduction, growth in sales revenue, maturity, and decline. You must pay attention to the life cycle of each of your products. Take note of their performance at each stage, and gather info that you can use to improve future products or offerings. 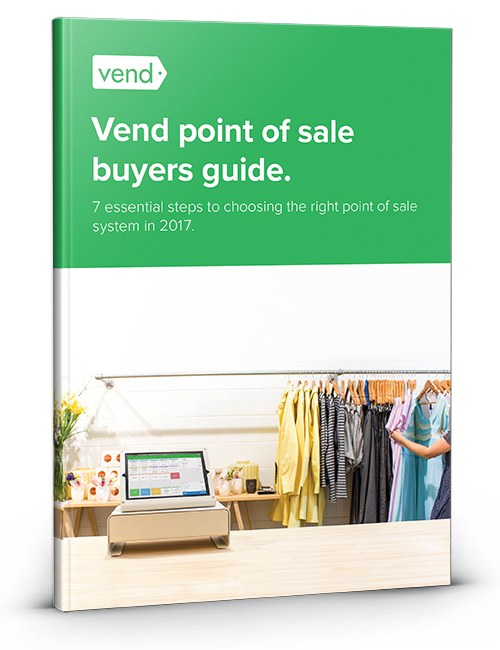 At its most basic level, a POS system functions as a cash register or till system that lets retailers ring up sales and keep a record of those transactions in their stores. But thanks to advancements in technology, POS systems - or ePOS systems - can now extend beyond the point of sale. These days, many POS solutions serve as retail management systems that handle everything from sales and inventory, to customer management and ecommerce. These are brands owned not by a manufacturer, but by a retailer or supplier. Retailers and suppliers purchase the goods, then label and market them under their name. This is a strategy that businesses implement to build loyalty and forge long-term relationships with customers. Relationship Retailing can come in the form of loyalty programs, personalized experiences, or superb customer service. An acronym for Radio Frequency Identification, RFID is a chip embedded in an item’s label or packaging. It stores information about the product and is primarily used for tracking purposes. Thanks to RFID technology, retailers can increase their inventory accuracy and reduce out of stocks. Inventory however, is only the beginning. Retailers are now looking into using RFID to get additional customer insights that would allow them to implement more effective marketing strategies and provide better customer experiences. In retail, this means letting customers select and pay for goods themselves, without requiring the assistance of a live staff member. Vending machines, kiosks, as well as self-serve checkout lanes in grocery stores all fall under this category. This pertains to the difference between the amount of stock that you have on paper and the actual stock you have available. In other words, it’s a reduction in inventory that isn’t caused by legit sales. The common causes of shrinkage include employee theft, shoplifting, administrative errors, and supplier fraud. You can prevent shrinkage by beefing up security in your store. Monitor customers, employees, and vendors/suppliers for suspicious behavior. Have accountability policies to reduce human error. Also, do inventory counts regularly especially when it comes to high-theft items. More commonly known as SKU, this term pertains to the unique identification of a particular product. 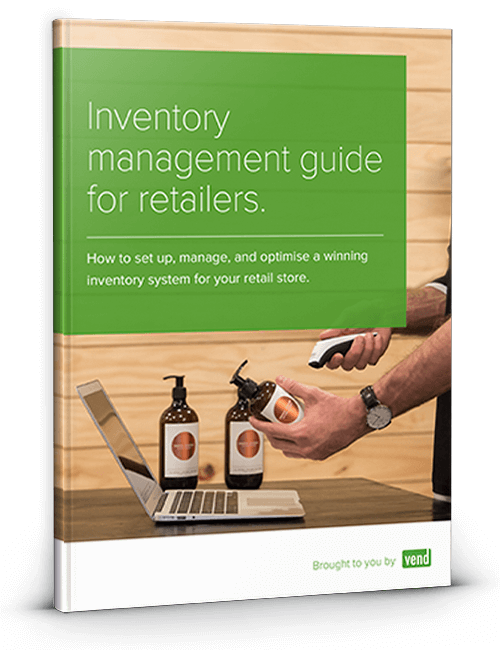 It’s used in inventory management and enables retailers to track and distinguish products from one another. A SKU represents all the attributes of an item, including style, brand, size, color, and more. S-Commerce refers to retail models or ecommerce practices that incorporate social media, user-generated content, or social interaction. Do note that the role of social networks like Facebook or Twitter in S-Commerce isn’t necessarily to serve as platforms for buying and selling; rather, they’re meant to assist the process and help drive sales. As an example, let’s look at Threadless. 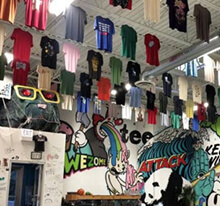 Threadless is an online apparel store that sources its designs from its community. The company enables artists to earn money and recognition for their designs by allowing them to submit their creations to the site. The Social Commerce aspect kicks in when the Threadless community votes and scores the submissions in order to determine which designs are chosen for print. The winning artists are then paid with cash prizes as well as royalties from their shirt sales. Showrooming is the consumer practice of examining products in a store, only to buy them for a lower price online. Shopping and price check apps perpetuate showrooming because they allow shoppers to compare prices and products using their phone as they browse the store. This term refers to the retail practice of tailoring everything you do--from your store design, to your ads, to your employees--for a specific tribe or group of people. With Tribetailing, you’re not trying to please the public or the masses. Instead, you’re zeroing in on a particular niche and are catering to them and only them. In retail, this concept is all about establishing a consistent brand or identity throughout multiple channels or platforms, including brick-and-mortar, ecommerce, or mobile. So whether you’re marketing and selling to customers face-to-face, on your mobile app, or doing it online, you’ll be able to deliver the same messages and give them the same great experience. Successfully implementing this involves properly training your staff, investing in the right tools, and more importantly, having one clear strategy and message. This is the practice of looking at products online before buying them in actual brick-and-mortar stores. It’s the opposite of showrooming, where customers look at products in physical stores only to buy them online. Image-based websites and social networks such as Pinterest or Instagram help perpetuate webrooming. Users see items that they like while browsing these sites and then go out in the real world to test or try them on. Smartwatches, smartglasses, and fitness devices like FitBit all fall under the wearable tech. These are gadgets that people can wear, and they can often sync to an app or other cloud-based software. Wearable technology can have some interesting applications in retail. For instance, merchants can potentially use them to gain insights into customer movement, activity, and behavior as they move about the real world. On the backend, wearable tech can allow retail employees to do tasks such inventory counts hands-free. It can also aid communication by enabling team members to communicate with each other without having to use hand-held devices. 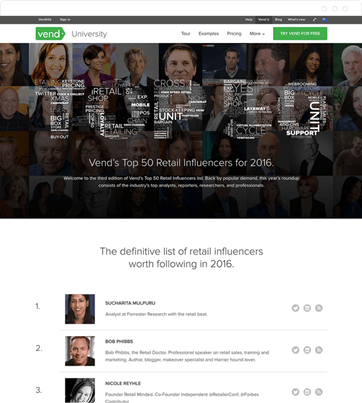 If you’d like to stay in-the-know with the latest and greatest industry insights, be sure to check out Vend’s Top 50 list of Retail influencers. Happy selling! 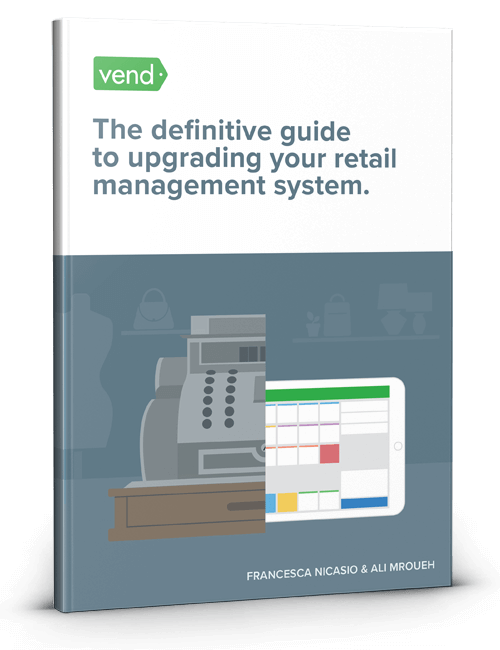 Vend Guides: Actionable insights from retail experts. Download our free guides, packed full of usable advice, practical tips and real-life examples.